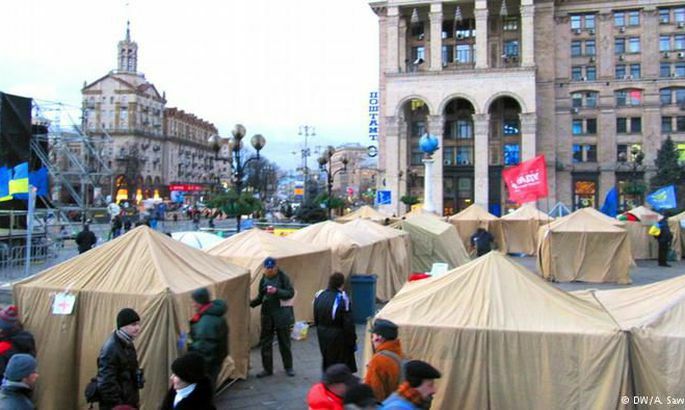 Tent city on Independence Square in Kyiv. Inconsistent and unsystematic approach wherefore the society fails to function, sounds the straightforward verdict on Ukrainian development by double Olympic bronze medalist Jüri Tamm in his Kiev office. With compassion, though, as the man is a great patriot of the renewed Ukraine. 58-aastane pensiopär Ljubov ei suuda kiire inflatsiooni tõttu tasuda pangalaenu. Kui inimesed on nüüd lõpuks vabad, siis on neil lootust saada ka vabaks riigiks, ütleb üle 15 aasta Ukrainas elanud Jüri Tamm. 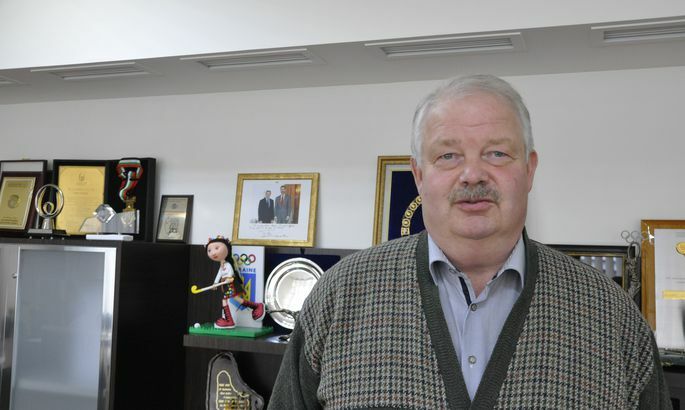 One-time holder of hammer throwing world record and Riigikogu member in 1999–2011, Jüri Tamm (58) is in his fifth year assisting the legendary pole vaulter Sergei Bubka lead Ukrainian Olympic Committee. Actually, for Mr Tamm Ukraine is his second home where he has lived for a total of over 15 years. «I keep feeling that the principles used here to build the state just don’t work as there just isn’t the skill to build a contemporary society,» says Mr Tamm. As Mr Bubka’s office manager, he’s had a kind of a front row seat to the post-Maidan changes in Ukraine. This week, it was two years from the initial protest meetings. A towering large man, Jüri Tamm spares no words describing the state of affairs in Ukraine, having pondered these for a long time. A well-known political scientist in Kiev, Volodymyr Fesenko more-or-less shares the views of the most famous Estonian dwelling in Ukraine, as I share with him the above. Today, anyone in Ukraine will tell you about lack of political will for genuine reforms. That is, except for the president and prime minister of course whose major mistake is still not having drawn decisively away from oligarchs. The most well-known of these – Rinat Akhmetov, Dmytro Firtash, Ihor Kolomoyskyi – are largely still in the saddle in every way. Clan politics and corruption haven’t gone anywhere, the state still resembles a business project. For the most part, reforms in Ukraine are just a mirage, on paper. Whoever has had more contacts with Ukraine, knows that in Ukraine the process has always been more important than the result. Regarding that, little has changes after the revolution. Nothing doing, Ukraine is too vast a state (purely by area, largest in Europe with or without Crimea) and a big nation (6th in Europe by population, between Spain and Poland) to have changes come fast. The more so that it is basically a situation of war. It’s an achievement in itself that the Ukrainian state has not totally collapsed and the hope is still alive among the people that the state will somehow be changed. In Ukraine, the society is currently much stronger than the state, is how an EU diplomat working in Kiev puts it nicely. They have some few areas where reforms have been a success post-Maidan. Firstly, it’s the army of course, changed altogether beyond recognition. But the army becoming fir for battle was indeed a matter of life and death, during the Donbas war. Secondly, the police reform carried out by Americans after the example of Georgia. In many major cities in Ukraine, the patrol and traffic police is altogether different now. The mentality of the new policemen ought to be different for the simple fact that former militia were not hired. In Kiev, people say the new policemen take no bribes. Thirdly, life has been made a little easier for entrepreneurs. When formerly it took about a month to register a company, now it is done in a day. (Though not over the Internet as yet). The tax system has been simplified somewhat by cutting the amount of taxes and making reporting easier. In the former USSR context, a small yet significant change is that the governmental leaders are no longer driving around accompanied by escorts bringing the traffic to standstill for hours in Kiev. And broadly, that’ll be all. Difficult to list as reforms are these: household gas price rise three to four times; electricity price rise 1.5 times; and the doubly dearer water and heating. The prices rose, quality of services didn’t. Herewith let’s consider the threefold devaluation of the purchasing power of the hryvnia since beginning of last year (then, a dollar equalled 8 hryvnias, now 24) and the 50 percent official inflation over the same period of time (in reality, however, prices have doubled if not more) as combined with minimal wage and pensions freeze. Put together, this makes for widespread disappointment with the lack of reforms, and rapid drop of living standard. In the park in Kiev, next to the house of parliament – a year and half ago a bloody piece of the revolution – tents are up again with people cooking food on fire. This is the so-called tariff-Maidan which is basically to protest the manifold price rise for utilities while also uniting those unable to pay bank loans due to the rapid inflation. Indeed, the latter are the most active to protest. (Thus far), the protesters are not many, maximally a hundred or so. The story of Lyubov (58) is typical. Four years ago, she assumed a loan of $100,000. Then, she got a dollar for 5 hryvnias. 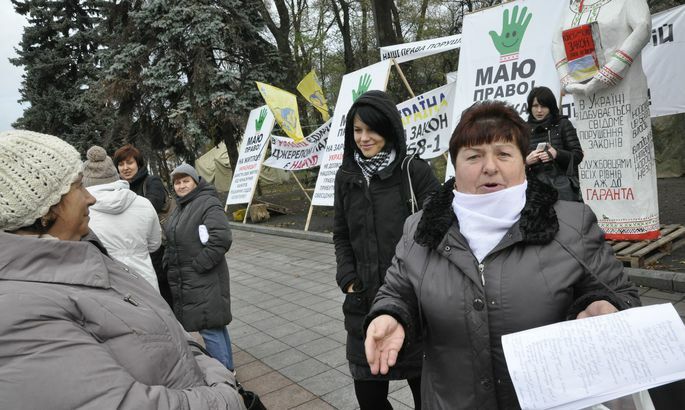 Now, the hryvnia is five times cheaper and Lyubov is a pensioner. Her pension id 2,500 hryvnias (€96) out of which she says she is only able to pay the interests but no longer the principal amount of the loan. «I already got the letter that I will be thrown out of the apartment to cover the loan. I will show them! I’ll defend my home with an automatic rifle if needed, when they come,» Lyubov almost yells at me, teary eyed yet militant. Such now troubled dollar-lenders are about four million in Ukraine today, they tell me on the tariff-Maidan. Allegedly, tens of thousands have already been evicted. Should the tariff-Maidan muster support by some major parties, it has the potential to grow into something serious. On the other hand, Ukrainians are visibly tired of such protests and while the nation sis still essentially at war many do not consider this morally right (even if substantiated). In Ukraine today, there is not real danger of a coup. Thankfully, Ukraine is too vast and rich a nation to go into total decline. By nature, people are entrepreneurial and accustomed to hope in themselves, the family and friends alone. The dark site to that is that common interests for many still take the last place in the list, despite the civil society and all kinds of helps organisations mushrooming over the 1.5 years. Next to the church, the Ukrainians trust the volunteers the best, studies show. In two years, Ukrainian GDP has dropped by over 20 percent. To find out the real living standard decline, the official statistics will sadly provide little help. Still, there’s too much of the envelope salaries – even in public offices. Also in the envelopes, loads of corrupt income is still moving about, wherefore it is vain to hope serious reforms for the state apparatus to be cut. State bureaucracy simply cannot be diminished for then very many would lose their livelihood. To illustrate the level of bureaucracy: over the 1.5 years, they have not even managed to put together a common electronic database of refugees i.e. people who had to forsake their homes due to the Donbas war. Army and police aside, all other vital reforms are halted: decentralisation is impossible to put into laws; court reform looks like a parody; with tax reform, they just cannot make up their minds (though gradually they are being inclined towards a flat 20 percent uniform income tax); energy reform (especially with gas) touches too many influential interest groups; health and education reforms are hindered by the overly conservative views in the society, and expectations for free services. Unlike army and police reforms, these require a relatively radical approach and come too close to the interests of the oligarchs. Also, all the above-mentioned unreformed areas are without exception sources of tremendous corruption. Fighting the corruption is the basis for the legitimacy of the current power, as recently stated by president Petro Poroshenko chief of staff Boris Loshkin. In that case, however, legitimacy isn’t too much of an issue as success in fighting corruption is nowhere to be seen. Last fall, the party of Ukrainian prime minister Arseni Yatseniuk did win the parliamentary elections, but a year later the party’s popularity was zero die to the still rampant corruption and lack of reforms, and he gave up participating with it at local elections. As demanded by the West, Ukraine is setting up a special anti-corruption agency. The head for the several hundred strong establishment was selected almost a year ago but the bureau has still not started working! With the interest groups, they are having a tough time fighting about who will sit at the committee which will nominate these special investigators. The joke has quire angered the EU and US embassy in Kiev. «The new anti-corruption institutions are indeed being created but for the most part these are only excising on paper as yet,» observes Mr Fesenko, the political scientist. Another well-known political scientist Tarass Berezovets says a reason is that the oligarch-president Mr Poroshenko fears for his own interests. «The president fears that it will begin to touch the interests of his partners and friends, and of the deputies of his (party),» said Mr Berezovets. For the main anti-corruption measure – raising the state officials salaries (for example: rank and file militia in regions get 1,800 hryvnias i.e. €70 a month!) – the state lack the money; also, this would prerequisite a broad-based public service reform which is indeed being talked about but is getting no traction. Almost every bill in Ukrainian parliament presents a fierce fight. «Every law seems to touch somebody’s interests,» says Mr Fesenko. It was a colourful show when the parliament finally voted for the gay-friendly labour core demanded by Brussels to grant visa freedom. «Better a gay parade than Russian tanks in Kiev,» contended the presidential party. Angering the nationalists. In the current situation of East-Ukrainian conflict and uncontrolled border with Russia is not making EU eager regarding the visa freedom. Ukraine is hoping for it to happen by the fall of 2016 – unrealistic, it seems. To the political scientists cited, pressure by the USA, and perhaps EU, seems the best means to push the reforms for they give the financial support. They welcome the «positive intrusion» citing the successful police reform. Citing a sobering effect, they also welcome foreigners working in the Ukrainian government. A hindrance is the differing understanding in Ukrainians what reforms are all about. An example would be land reform which they do not want: Ukrainians do not want land to be freely bought and sold. «They want rental relations,» explains Mr Fesenko. Likewise, they are altogether reluctant regarding privatisation. As early as in 2014, the Ukrainian government promised the West to privatise state assets for 17 billion hryvnias. Till today, no privatisation competitions have been proclaimed. Meanwhile, there are some 1,800 state enterprises in Ukraine and not more than 200 might be considered strategic for the state. The Ukrainian society is all against privatisation – based on experience, they do not believe in honesty. Rightly so: for the most part, top politicians remain the same. An idealist, Jüri Tamm thinks that an international mega event might help – like EXPO or some title tournament. Perhaps, the nation would rally and reform around the challenge.